I will uploading some images and also compiling the rules in English for those that have bought the game from Pegasus but do not speak German. I will also be putting up the article from Dragon Magazine called King of the Tabletop. This is a Kings and Things-like game with Tom Wham art. 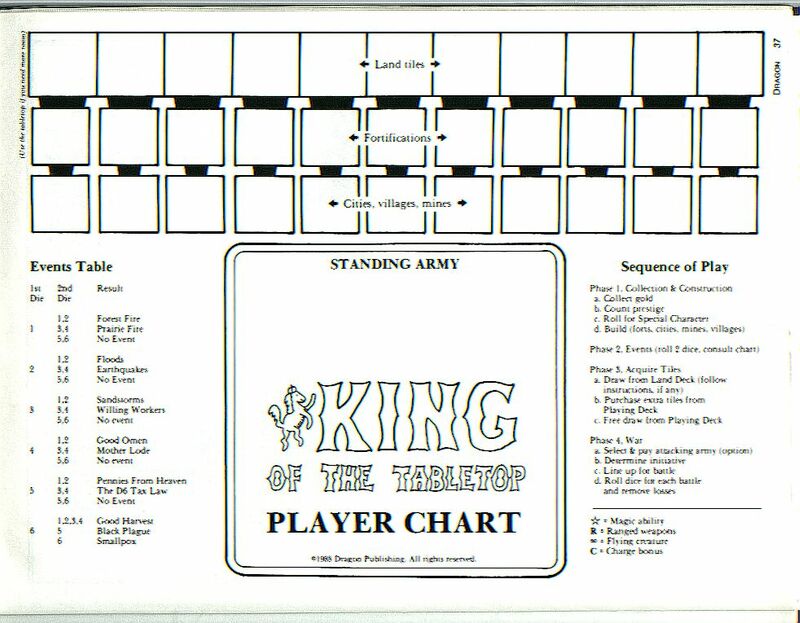 King of the Tabletop is available from Tom Wham's website at: http://www.tomwham.com/stuff.html. As such, I have removed the links below. For my legal edification, I am only posting the rules because the game is no longer available in English, I am posting Chit sheets only for the English translation. This is not for distribution as the chits have pictures that are more than likely copyright of Tom Wham. I do not wish to infringe on anyone's rights. This is for personal use only, not for commercial purposes. Yes, I want people to come and read these rules, but only because I know a lot of English, Austrailian and Americans that love this game and can not get it in the English language. Also, I contact Wizards of the Coast about the early Dragon article in which I have scans. They told me that the early copyrights were held by the authors of the article. I have searched for the author of King of the Tabletop and not found an e-mail or such. If you are the author and wish to e-mail, click the link above and tell me. Thank you and have a nice day.